Options in India: India Inc is HOT!! Coming home to India..
India Inc is HOT!! Coming home to India.. I have been a little slack in blogging during the past fortnight!! It is interesting to note while some of the sentiments mentioned elsewhere on this blog are reiterated -there are some concerns too!! for eg an article earlier last week in the Financial express summarises the 'India story" very succintly ! A megamart of more than 300 million middle-class customers, India is where global businesses are turning to, to train their CEOs for tougher battles. This is where the action is, and India is no more a punishment posting! -Enamoured by India, corporations worldwide are looking at not just having a foothold in this country, but to even have their global headquarters here, if recent happenings are anything to go by. The Wisden Group, Cisco Systems, among other IT companies, apart from companies across sectors—auto, retail, infrastructure, consulting, et al—are increasingly having crucial divisions, whether manufacturing or research and development, and their key personnel, driving these powerhouses operating out of India. - MNCs are prompted to send some of their best talent from around the world, many of them of Indian origin. 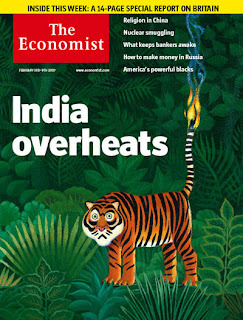 And elsewhere -whether it is the statement given by the RBI Governor or the Economist cover story , there are debates on whether the Indian economy is overheating!! Well....its all happening , isnt it !! ?